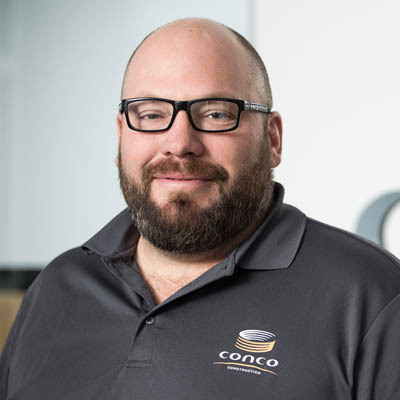 Brent Russell has been with Conco now for more than a decade. As a superintendent, he manages onsite field operations. Responsible for overseeing Conco crews and subcontractors, he says he really enjoys being in the field every day working with craftsmen. Russell has a bachelor’s degree in Construction Science and Management from Kansas State University. He says working at Conco is both challenging and rewarding because everyone strives to exceed client expectations. He tells the story of working for a client on a plant shutdown alongside other general contractors. “We got a call in the afternoon about another contractor that had fallen behind on some of their work. We gathered a crew that had already worked all day and began work around 7 pm. The crew worked into the night and by early the next morning had gotten the other project back on schedule.